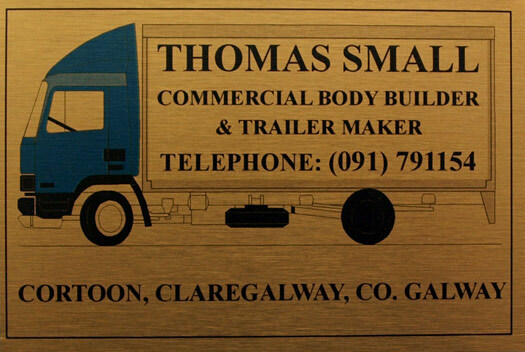 Achill Signs offers digital printing onto a wide range of materials, including brushed metal. This allows us to create high quality printed metal plaques suitable for door signs, nameplates, award trophies and many other purposes. 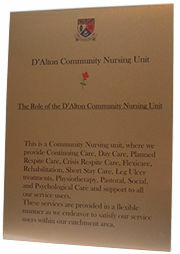 Printed metal plaques are suitable for both interior or exterior use. Using digital technology means that images and layouts can be easily scaled for different size plaques, and with no loss of quality. Corporate logos can be faithfully reproduced and designs can be displayed in full colour. For awards and trophies the dedications can easily be personalised within the same template. Digital printing of plaques offers a fast, versatile and cost-effective alternative to traditional engraving, and allows for high quality and consistent reproduction of the most complex of designs and layouts. Contact Achill Signs today to discuss your requirements for plaques, nameplates, award trophies or other printed metal solutions.